The top four Mayoralty candidates have released their transit plans. This is the first of a four-part series assessing these plans. In a nutshell, current front-runner John Tory believes that above-ground subway lines are the best way to go. He proposes a line following GO train tracks where possible that will run across the city from east to west, passing through Union Station. London has many of these – in fact 52% of London’s subway network is above ground. London has been building subways since the early 1860s – nearly a century before Toronto opened its first line. Unlike London where new above-ground subways have been able to take over existing but unused railway lines, Toronto has no such advantage. New tracks must be added to current ones and, where none exist (along Eglinton for example), carved out of the existing landscape. Think of the disruption we are enduring here in the comparatively simple task of adding GO tracks to the existing line and right-of-way through Weston – imagine what carving out a rail corridor from scratch will involve. Unfortunately, the corridor along the north side of Eglinton (that Mr. Tory appears to think still exists) was sold off as surplus by the city in 2010 and is now a construction site for hundreds of new homes. Where Mr. Tory’s SmartTrack will fit along this route is anyone’s guess. And all of this will allegedly come to pass in 2021. John Tory’s Transit Plan – click for larger image. 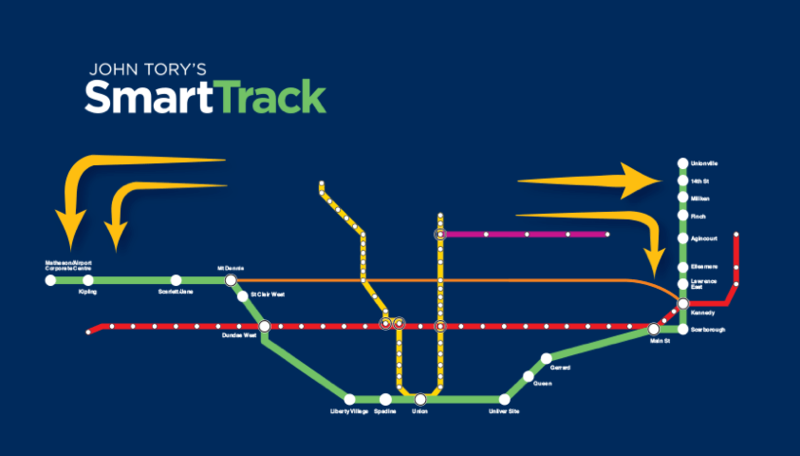 At its western end, Mr Tory’s SmartTrack line begins at the Matheson / Airport Corporate Centre (not the airport) – which connects to Mississauga Transit. It travels along Eglinton – until a few years ago, the planned route of the Richview Expressway. Once it hits Mount Dennis, the SmartTrack joins and heads down the GO / U.P. Express tracks towards Union. No mention is made of the U.P. Express or what his plans are to retain or modify the service. Mr. Tory claims that the billions needed for SmartTrack will come from tax increment financing. This is the financial wizardry in which extra money is provided in the future by additional tax revenue generated by higher property values and therefore higher tax assessments along the new lines. Tax increment financing is how Rob Ford proposes to pay for his subways subways and more subways. ‘Nuff said. John Tory’s anticipated flow of passengers. The Tory plan theorizes that passengers will be diverted from the east west and north-south subways and buses and use the SmartTrack trains from the west and east ends of the city to get to Union. This will provide, “congestion relief on the Yonge line for someone who lives in Lawrence Park or Leaside”. Unfortunately, most commuters don’t want to go to Union Station. Only 260,000 do so daily and that’s using GO Train, GO Bus and subway combined. Bloor-Yonge is already straining with 420,000 daily passenger movements. Mr. Tory’s plan will simply add more pressure on this station from passengers hopping off SmartTrack and onto the Bloor Line in the West or East. Yes, the people of Lawrence Park and Leaside may be more comfortable but SmartTrack will add even more congestion to an already congested area. A downtown relief line is seen by experts as the only answer to this rapidly growing demand and Mr. Tory does not adequately explain how his SmartTrack will be an effective substitute. It’s one thing to think outside the box and come up with a concept such as an above-ground subway. It’s another to believe that you and a group of your political advisors can ignore expert opinion and sit down with a map of the city and magically determine the fate of transit in this city for decades to come. The experts say that a downtown relief line is needed. SmartTrack is not an effective substitute. With regard to finances, tax increment financing is fraught with peril. Extra revenue generated by such accounting sleight of hand is not guaranteed. This windfall would normally be taken into account to maintain and upgrade the city’s infrastructure so it’s not just free money. Mr. Tory should defer to the experts (who spend whole careers immersed in the topic) before launching Toronto in yet another whimsical transportation direction with magical financing. The incumbent Mayor’s floundering has cost us dearly and set transportation in this city back by several years. Let’s not add even more delays and band-aids to an increasingly desperate situation. SmartTrack is the wrong track. Why are politicians so loathe to consult experts? We all live here, not just the grandstanders who will be in office for 4 years.